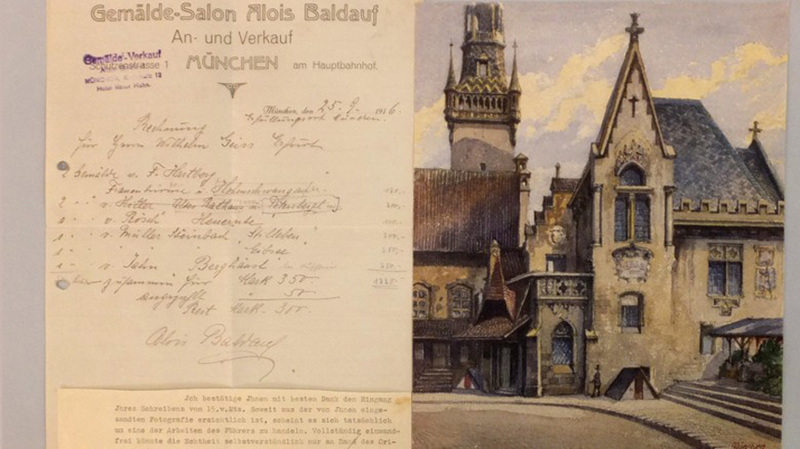 A watercolor painting of Munich’s old city hall, which is believed to have been painted by Adolf Hitler in 1914, has been auctioned off for $161,000 at an auction in Germany to an anonymous buyer from the Middle East. The painting is entitled “Standesamt und Altes Rathaus Muenchen” (Civil Registry Office and Old Town Hall of Munich). It was sold at the Weidler auction house in Nuremberg, the site of the post-war Nuremberg Trials in 1945 and 1946. Hitler’s watercolor reportedly attracted bidders from four continents. Five other Hitler paintings were also auctioned off, garnering more modest purchase prices (between $6,000 and $100,000). Experts consider the late Nazi dictator’s paintings to be of mediocre quality. Prominent auction houses generally refuse to sell Hitler’s works.